This morning the alarm rang at 4:15 and I almost thought "Well, it's my birthday--- I should stay in bed and then get up and eat pancakes...."
Because it IS my birthday. I managed to get around the planet one more turn without dying. 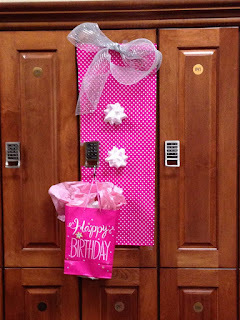 And because I would like to make it another trip around, going to the gym IS my birthday present. To me. The bag has wine and the she got me a TON of jellybeans because she's hilarious. You see I am liberal and she is conservative. I often ask her to translate conservative logic to me and she will have me decipher the liberal take on things. The jellybeans are a reference to Reagan and her card had an elephant on it. She also wrote the most hysterical wishes for my upcoming year. Including her getting a job she really wants. Which cracked me up. At 5 am, that is quite impressive. 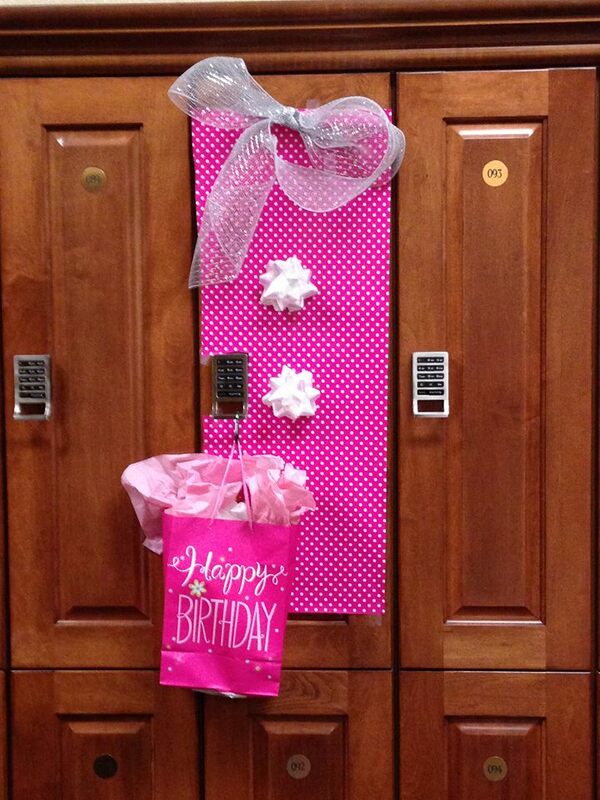 By the way, having your locker decorated is just as cool at 46 as it was at 14. The rest of my day was going to be spent working with the jazz band this morning, then getting free coffee at Starbucks, enjoying the office birthday party put on by my office manager Julie who makes everyone feel special on their birthday, installing a new external hard drive, getting my nails done over lunch, one client meeting and then the Cheesecake Factory for dinner. I say "was" because my daughter has that throat thing that's going around. She came home with a fever yesterday and she's a little warm today so rather than risk it, she's staying home. My son, last night at lacrosse, had a coughing fit and looks a little grey. Last year, he ended up in the ER with bronchitis because he doesn't ever act sick. So he's here, too. On the couch. Watching Star Wars, of course. I've got a lap top to get some work done. I changed my one meeting to a web conference. So when we talk about values alignment- health & family are top priority today. Excellence & integrity- I'm working from home, so hopefully I can return calls & email as needed and not drop the ball. Happiness- well, it's my birthday. I spent the early morning with my friends and the rest of the day with my family. Today is definitely in alignment. No matter who calls and is upset that I can't personally control the Chinese economy and oil markets, I will know that I am in the right place, doing the right thing. I had a client tell me that the 50s are the best. He felt the best about who is was, had good health-- I can see that now that I'm over the hump heading towards 50, he's right. That confidence that you regain as you age-- and I say regain because I think we all have it but life knocks it out of us- is truly quite liberating.